On November 14, KCD held a signing ceremony for seniors Emily Harrison (James Madison) and Megan Read (Michigan) in the KCD Theater. 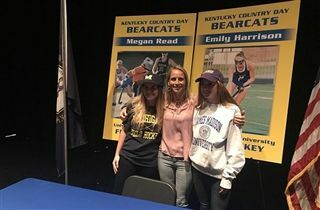 Megan signed with the University of Michigan to play field hockey, and Emily signed with James Madison University to play field hockey. During the ceremony, KCD Athletics Director Dr. Green noted that fewer than 2% of all high school athletes sign athletic scholarships, so this is truly a huge accomplishment. Congrats, Bearcats, and congrats to Coach Amy Elliott and the field hockey coaching staff for helping these athletes reach their potential. We’re so proud of these young women! Go Bearcats!